As reported in the local Mansfield and Ashfield Chad this week potential slippery conditions beckon resin bonded resurfacing as the gritters are being sent out for the first time this winter. “This forecast means that unless there is a major change in temperatures later today. Nottinghamshire’s gritting teams will be out and about salting the main routes across the county from 8pm. For updates this winter check the @NottsCC Twitter feed. It’s the latest activity which forms part of the annual winter preparations. All being put into force by Nottinghamshire County Council and its new joint venture company Via East Midlands. Garry Chadburn, team manager for electrical and environmental maintenance for Via East Midlands, which is managing highways services on behalf of Nottinghamshire County Council, said: “Unless temperatures dramatically rise, it looks like our gritting teams will be making their first run of the season tonight”. In all, the County Council gritted on 69 days last winter, between October/November and April. It completed 71 runs on main routes and three runs on severe weather routes. The County Council only salts A and B roads, heavily trafficked major roads and many main bus routes. It only treats residential areas where they fall into the other categories – no council does as the priority is to keep the main road network open. This has been reinforced by a local enquiry as the slippery conditions beckon resin bonded resurfacing. The client has an imprinted concrete surface and has found this extremely slippery over the past few years. 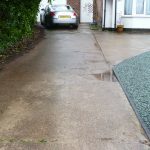 In addition the need to maintain the surface with a sealant is actually worsening the surface and as a result of this the slippery conditions beckon resin bonded resurfacing for them. We have over the past few years notice an increase in demand for anti slip surfacing and always at this time of year. This is not particular to imprinted concrete though there has recently been the need to work on a tiled external surface. However if you are thinking about the winter and the issues please give us a call for a chat. Mansfield, Ollerton, Shirebrook, Heanor, Kirkby in Ashfield, Stonebroom, Sutton in Ashfield, Shirebrook, Clowne, Mansfield Woodhouse. Dont forget our resin bonded resurfacing will extend the life of your existing surface as well. This entry was posted on Sunday, November 13th, 2016 at 11:26 am	and is filed under Chesterfield, Concrete, Derbyshire, Diary of a Mansfield Resin Driveway Company, Driveways, gardens, Kirkby in Ashfield, Latest News. You can follow any responses to this entry through the RSS 2.0 feed. Both comments and pings are currently closed.